What happens in the trip, stays with the tripmates... and it still does! The next day was overwhelming, it was going to be the New Year's eve! We woke up embarrassed, unable to put up with the guilt of having troubled the two poor souls and not letting them catch enough sleep! The reverse strategy worked wonders as the guys chose to follow 'ahimsa' in everything they did. We drove to the Brihadeeswara temple, spectacularly magnificent at the very first sight! The three 'dwars' spoke of might and fight as we entered the premises. We bargained to our brain's content to find a guide who could balance his output of knowledge with the input we had to offer. This time I was determined to visit the deity irrespective of the queue, even in the absence of enough support among us. The Shiv Ling was huge! I did not wish for anything for it was more of history than devotion to me! We went around the temple as the guide took us past architecture, literature with logic, beliefs and narratives in the background. We left no void to fill in for our 1-2-1-2 (One of the amazing shots in our movie) and thanked the guide for being so patient and kind to us. After a heavy breakfast in a restaurant close by, we left for a near by palace- another tourist attraction at Tanjore. The palace reminded me of the Lotus Mahal in Hampi. I somehow had to compromise on my definition and visualization of palace. With due respect to architecture and the builder, we went around the open place observing the carvings. The space could have been maintained better (cleaning the cobwebs atleast) but we apparently clicked a couple of pictures before we moved to the museum. The museum was interesting and helped add to my knowledge of history! An hour at the place and we chose to leave for Abi's Inn in the scorching heat. It was difficult to believe that we would be celebrating New Year tonight! We packed in minutes only for the reason, we did not want the New Year's eve to go unplanned at any cost. As the guys drove to Pondicherry, we slept to our heart's content having made all the necessary arrangements to not let the sunlight and heat in. 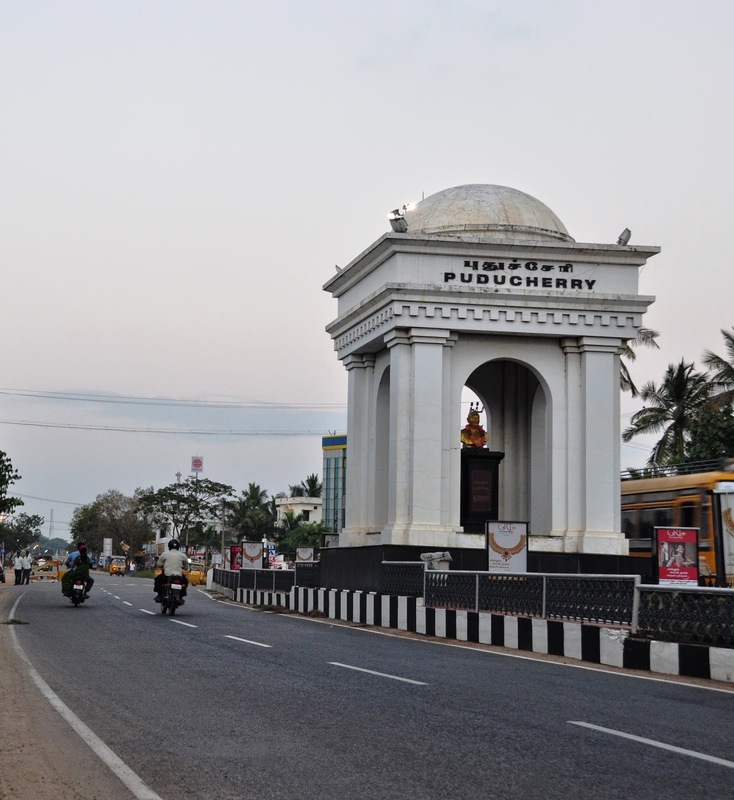 I had always heard about Pondicherry, and this was my time to be there! As we reached Pondicherry, we were greeted by a welcome arch and it somewhow felt special to me. We parked the car, went to the arch and clicked a pic with the four of us and Pondicherry in the background. This assured me that 2014 was surely going to be interesting! We reached La Marina, our home for the next two days. The area was so French that I felt confused for a moment. Pondicherry wore the New Year look- the music, beautiful lights, people around just added to the aura and we were perfectly set to celebrate!